Dinner With My Family #5: Burgers and Fries! So, how exactly is that a healthy meal? For starters, the burgers are made out of beans, not beef or pork. 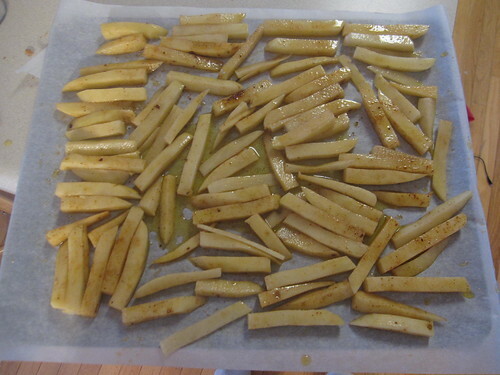 For another, the fries are fresh potatoes, sliced and dredged in a bit of olive oil, then baked in the oven. 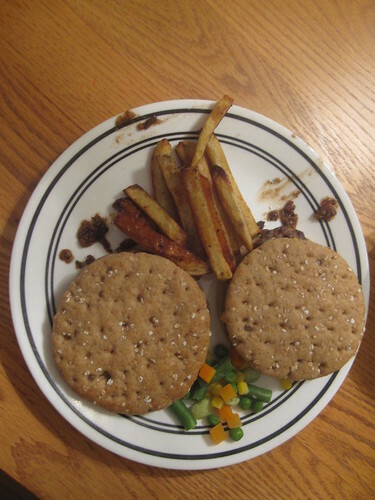 Even better, this meal cost less than comparable options, and it’s pretty flexible for those of you who think that a purely bean burger sounds awful. The ingredient list is really simple. 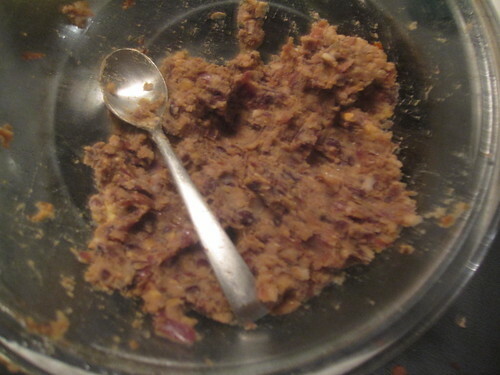 For the burgers, you just need a cup and a half of dried beans or a can of cooked beans, plus whatever you wish to use for flavoring. I typically use about half of a minced onion, a couple teaspoons of minced garlic, plenty of pepper, and a few dashes of salt. I also used about a mouthful of beer. You’ll also want buns or bread. For the fries, you just need a couple large potatoes, some olive oil, and some salt and pepper. You can, of course, use other seasonings, too. All of these ingredients (using dried beans) added up to approximately four dollars and fed our family of four with two meals’ worth of leftovers. 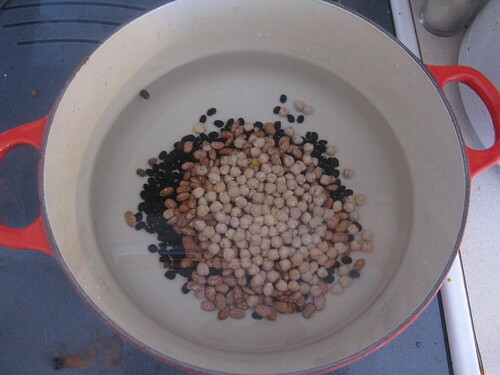 If you’re using dry beans and don’t already have some cooked, put them on to soak for the night. The exact type of beans doesn’t matter too much. I usually use a mix of red beans, black beans, and chickpeas, a half cup of each. Use whatever you like – if you’re using dry beans, though, figure a quarter of a cup of dry beans per burger you intend to make. You might also wish to peel and slice the potatoes if you’re making oven fries. If you need to cook the beans, do so. They will be done after sixty to seventy five minutes at a low boil. You can boil them in advance if you’d like, but use them within a day or two. You’re also going to want to preheat the oven to 400 F. Then, take a cookie sheet and spread parchment paper on it. 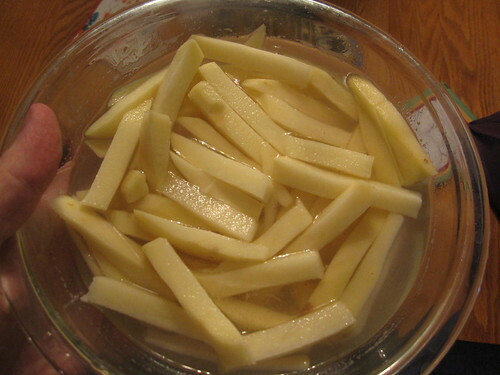 Take a bowl, put half a cup of olive oil in it, then start dredging the fries through the oil and placing them on the parchment paper. When they’re all spread out, sprinkle some salt, pepper, and other seasonings you might like on top of them. We like to experiment, so we tried some chili powder on ours. Bake these in the oven for about forty minutes or so and they’ll be delicious – crisp on the outside, soft on the inside. While they’re in the oven, take your beans and mash them. I just use an old-fashioned handheld potato masher. It takes two minutes, tops. When that’s done, take minced onions (if you’re using them) and cook in a skillet together with a couple drops of oil over medium high heat. Keep cooking them until they start to brown and have a wonderful smell, then add minced garlic and cook for another minute or so. Add all of this to the bean mash and stir thoroughly. While the skillet is still hot, I put about a mouthful of beer into the skillet, causing it to boil and get some of the wonderful cooked pieces out of the skillet. I pour this right into the bean mash and keep stirring it. Don’t be afraid to add plenty of whatever spices you like right to the mix. You almost can’t overdo it. The only way to go wrong is to add spices that clash in flavor. 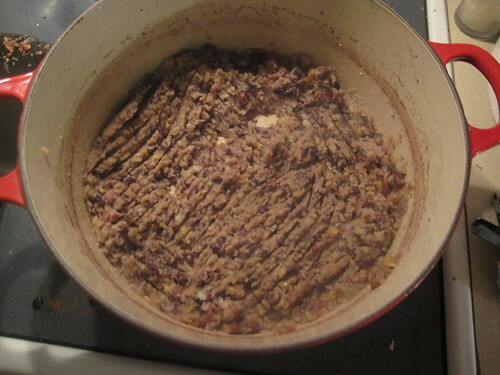 If the mix is runny, add some bread crumbs or some ground oatmeal to thicken it. You’ll want it thick enough so that it easily forms very firm balls and patties. At this point, just make small balls from the mix and form them into patties, then grill them or cook them in a skillet with just a bit of oil to help with sticking. Cook them over medium high heat, flipping regularly, until both sides are nice and browned. Put it on a bun, top with condiments to your liking, and enjoy! Our family likes them, though we have been turned off in the past by awkward seasoning (but never by too much seasoning!). If you want to change this up a bit, the easiest way to do it is to combine unmashed beans with ground beef to make your own burgers. 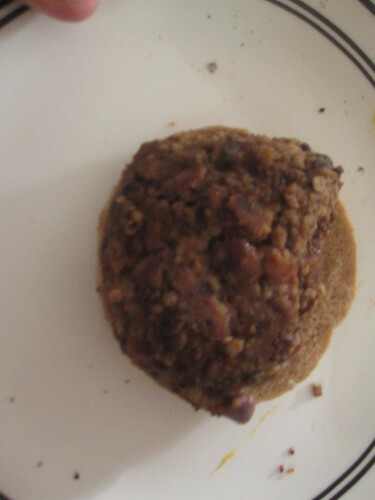 It reduces the cost, adds some texture to the burgers, and changes up the flavor a little bit as well. You can also, of course, vary the flavorings. There are countless things you can put into the mix, from Worcestershire sauce to pineapple pieces. Never be afraid to experiment a little.